Bon Iver's debut album 'For Emma, Forever Ago' was about the nicest 9 song album you could find on the planet a few years back. Well Justin Vernon has done it again with the release of Bon Iver's self-titled album. This time he comes back at us with a 10 song album that is emotionally tied as the debut. I have now listened to this album on 5 different occasions and from the first listen my opinions on the album have continued to shift. The first 4 songs on the album blew me away. It was one of those things where you rank your songs on itunes out of 5 - it was a 5, 5, 5, 5 for me. I did not find any faults in those songs whatsoever. 'Perth' is such a nice opener with the added drums this song was an instant favourite. It offers a perfect flow of melodies with all of Justin's incredible vocals. 'Minnesota, WI' vocals are really used to do a lot of the work here. 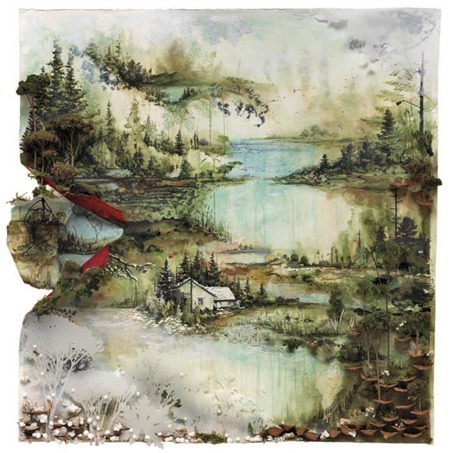 It has that twangy/folky sound that brings out the best in any Bon Iver track. 'Holocene' is a slower more sincere song, with its vocals really putting this song to the test. I really enjoyed the guitar noises chiming in and out throughout the song. 'Towers' gives a little more upbeat effect throwing off some positive vibes, with once again the vocals stealing the show. 'Michicant' is the next song and to me it didn't have the same effect as the previous four songs. It still is a very good and chill song but just didn't hit me the same way songs 1-4 did. 'Hinnom, Tx' is a shift in vocal styles, giving off an echoing effect throughout the song. It is a very catchy and enjoyable song. 'Wash.' gives off some friendly piano key sounds that help shape the direction of this song. Now comes 'Calgary' which is the first single off the record that we first heard last month. My first impressions were "What you hear with Calgary is a very Pretty tune. Even at first listen it is hard to find any faults with the song, the only thing maybe that it is just too nice and pretty of a song." Now after some further listens a feel it is more of a journey song that tells a certain story through its music. The story telling through song is one of Bon Iver's great strengths and one that he will always continue to do. 'Lisbon, Oh' is a short little instrumental song that walks you right into the conclusion of the album which is 'Beth/Rest'. 'Beth/Rest' is a unique song to me, the first time I heard it I thought that the start was a little too over done. It sounded more like a cheesy 80's love song. Although initially it was not my favourite song on the album it has been the biggest grower on me from the album. And in the end I really feel this is the perfect type of song to close out another classic Bon Iver album. Bon Iver is an indie/folky music beast, who's music is honest and real in every way. Justin's honesty and song writing talents are the key ingredients that make Bon Iver so incredible. He never tries to be something he is not - he just continues to bring the world some beautiful music. I love love love this album. Then again, what music critic doesn't? I haven't read one bad review of it, and it was actually hard for me to write a review because I simply can't find anything wrong with it. "Beth/Rest" is actually one of my favorites. I have always loved that 80's pop vibe, and I think it's so different from the rest of the album that it works. Either way, incredible album.